The Rapiers have consistently appeared at major venues throughout the UK and Europe. They have starred as The Shadows in ‘Cliff: The Musical’ in London’s West End and spent four years with Freddie Garrity recreating the original Freddie and the Dreamers stage show, as well as performing at the prestigious London Palladium on three occasions. 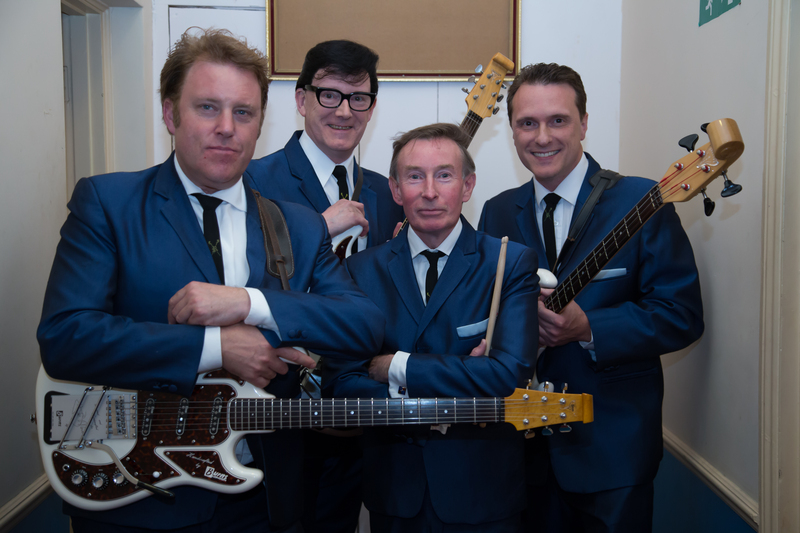 The Rapiers have had the privilege of working for Sir Paul McCartney, Jeff Beck and of backing Sir Cliff Richard. Even the established rock stars book them for their own parties! The group have had the honour of working with the late great Jet Harris (from the Shadows) for nearly 25 years and have also played for Rick Wakeman at Mercedes Benz, as well as the Williams F1 team (where they spent very enjoyable evening with George Harrison). National T.V. advertising campaigns have come in the form of Walkers Crisps (with Gary Lineker) and Pontins. Both adverts see the Rapiers appearing as The Shadows on a traditional red London Routemaster bus. The Rapiers founder member, lead guitarist Colin Pryce-Jones along with drummer John Tuck have both been playing since the 60’s and along with Neil Ainsby (Rhythm Guitar) and newest member Lee Restarick (bass guitar) have attained critical acclaim for their talent and showmanship. The group have built an exemplary reputation for their totally authentic stage presentation, which includes Vox amplification, Fender and Burns guitars and a 1962 Champagne Sparkle drum kit. Dedication to all things early 1960’s is paramount to their live show and on all of their recordings, some of which are now featured in the ‘Record Collector Rare Record Guide’. Whenever you see The Rapiers – When the curtains open, visually and musically you will be transported back to the magic that was the early sixties. 1960’s British beat music, the Twilight Zone of The Rapiers for the last 30 years.